Moved with holiday cheer and the spirit of giving, Rudolph nudges a Christmas gift towards Clarice. 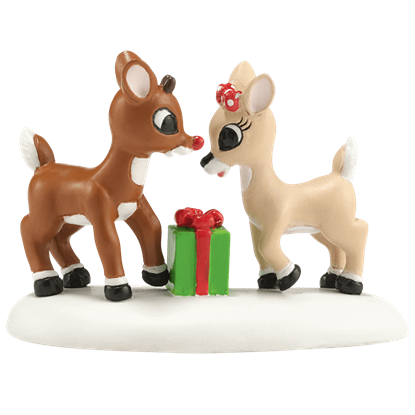 Paying tribute to the classic holiday special, the Gift From Rudolph figure shows the two reindeer with a wrapped present. 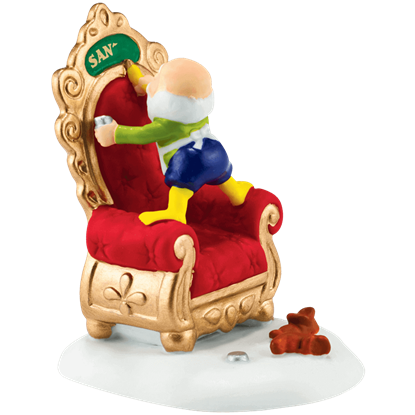 With careful precision, a skilled elf writes Santas name on a regal chair. 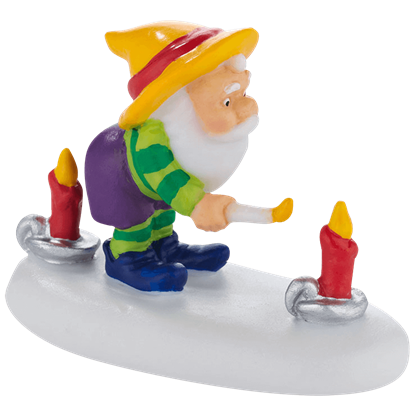 Made of hand painted porcelain, A Personal Touch is a holiday figure from the Department 56 North Pole Series that depicts this Christmas elf hard at work. Using a remote control device, Santa and his helper are testing out the toy airplanes today! 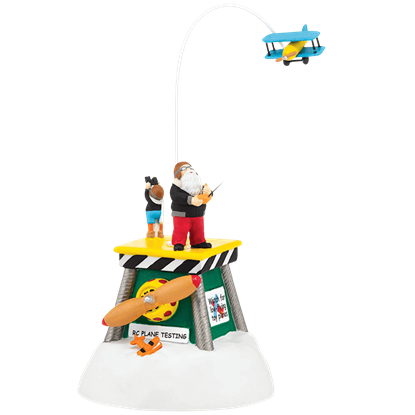 The Animated Flight Test figure features a model plane that rotates around the snowy air traffic control pedestal below. 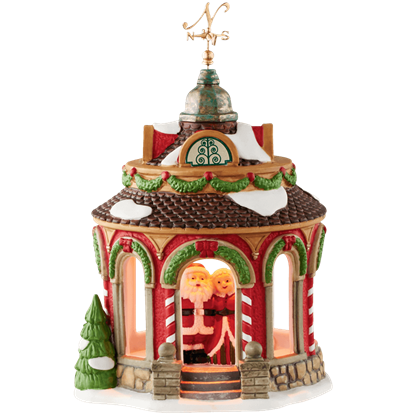 Within the Anniversary Gazebo, under the glow of an LED light, Mr. and Mrs. Claus stand in a cozy embrace. Part of the North Pole Series by Department 56, this delicately detailed collectible offers an abundance of elegant cheer. Everyone loves to watch bobsled races, even at the North Pole! 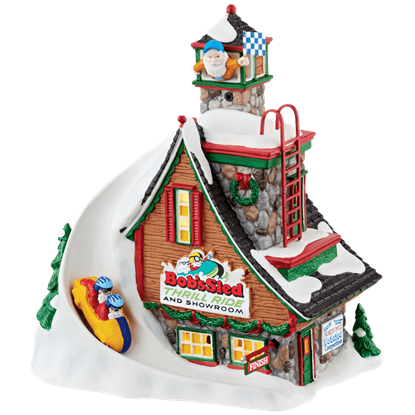 Stop by Bobs Sled Thrill Ride, and jump on a sled with one of Santas elves. Bobsleds are on display in the showroom and can be taken on a test drive on the rooftop track. Quality control at the North Pole remains a vital task - especially during the final inspection of toys! 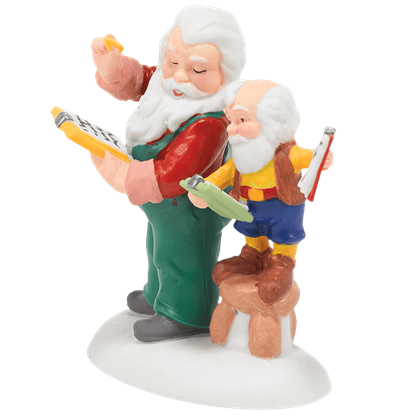 In the Check and Double Check figure, Santa is going over his lists and checking them twice with the help of an elf assistant. This hard-working baker elf mixes up a jumbo bowl of frosting to meet the extra holiday demand at the bakery. 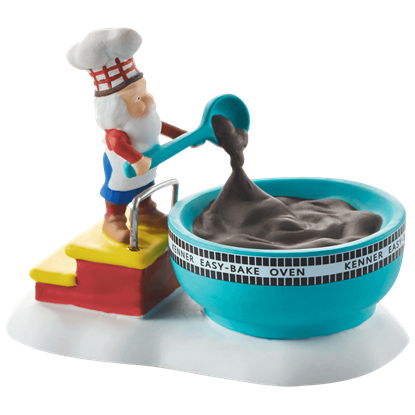 The Easy-Frost Frosting figurine showcases the elf as he climbs a couple of steps in order to reach the bowl. Oops! Looks like someone missed the mark - and the back of the sled! 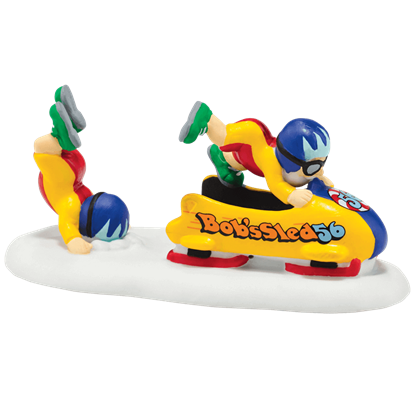 The Face Plant figurine displays an unfortunate bobsledder who has ended up with a face full of snow instead of joining his partner for takeoff. Inspired by the toy making elves down the street, the baker elves have a new facility modeled after the popular retro Hasbro Easy-Bake oven. 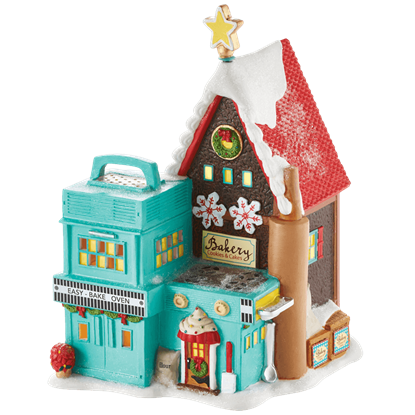 Peek inside the Hasbro Easy-Bake Bakery to see the elves hard at work making sweet treats. Santa sees to it that there is always plenty of hot chocolate for his industrious elves. 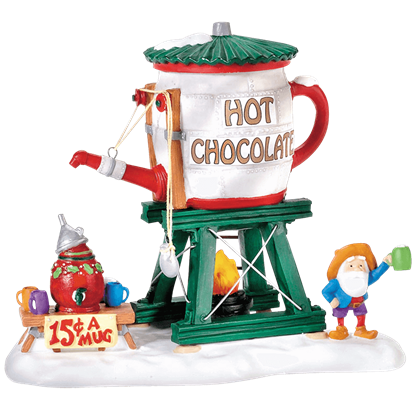 The Hot Chocolate Tower will keep the busy elves warm and ready to work at the North Pole. And at 15 cents a mug, it is quite a bargain! Jack be nimble, Jack be quick! Can Jack jump over the candlestick shop? 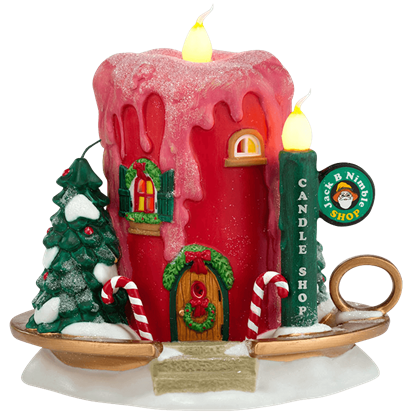 The Jack B Nimble Candle Shop is designed to look like an old-fashioned candle and holder. LED flame adds a warm glow to the festive Christmas shop. Jack be nimble, Jack Be Quick! Our elf friend, Jack, enjoys adding candlelight to his festive holiday habitat. He might need to move quickly in a moment, though - the seat of his pants look like they are getting a little too warm.